I finished doing the carcass of the bathroom vanity. It’s constructed out of Pre-finished plywood. That means I dont have to muck around trying to put a finish on the inside of the cabinet after its all assembled. In addition the factory applied finished is much tougher than anything I could do in the shop. 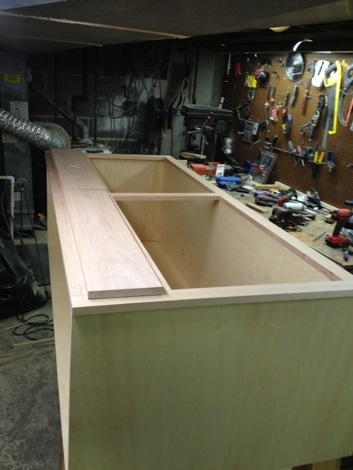 The carcass is made of 3/4″ plywood ao t will handle plenty of abuse and is constructed with dado’s and screws. I used my festool TS-55 track saw to make perfectly straight cuts, however they were not as square as I would have liked. I’m not sure why that is as I squared up the track each time before the cut. It is something I will have to pay attention to in the future.